This one-day conference will examine the intersections of digital methods, cultural politics and feminist theory. The conference will bring together Doctoral students as well as early career researchers working in media and cultural studies, gender studies, digital media, feminist science and technology studies, and queer studies. Further information will be posted at here. Attendance is free but spaces are limited. Advanced registration is necessary. 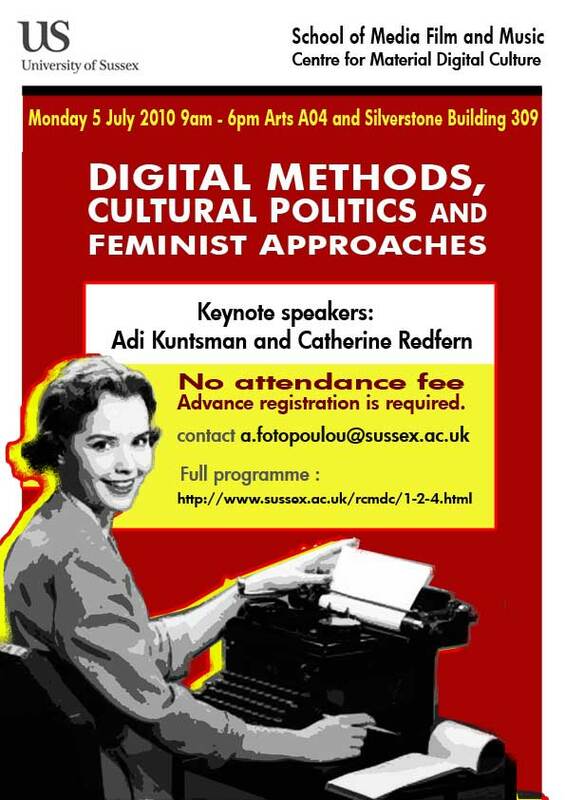 Please email a.fotopoulou@sussex.ac.uk with your name, affiliation and DIGIFEM in the subject line to reserve a place. This entry was posted in Conferences and papers, feminisms, internet research and tagged Cultural Politics and Feminist Approaches, digital methods, graduate conference, sussex on June 11, 2010 by Aristea Fotopoulou.